I don’t have a lot of Belleek porcelain, but I sure enjoy what I do have! Belleek started in 1884 and is known for its beautiful creamy white porcelain. The factory is located in Belleek, County Fermanagh, Northern Ireland. 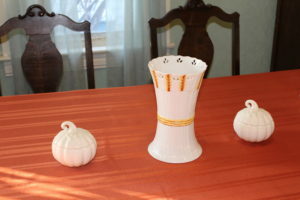 My first Belleek piece was purchased from QVC. It is a gorgeous vase in a wheat sheaf pattern. My great-grandparents were homesteaders who grew wheat, so this piece has sentimental value, as does Ireland itself. My beloved Belleek Wheat Sheaf vase honoring both of my mother’s grandparents-wheat growing homesteaders and Irish immigrants.